Unlike the hatchback, the A35 sedan should be available in the US. Customer deliveries have already begun for the Mercedes-AMG A35 hot hatch in Europe, but US buyers will need to wait for the A35 sedan to arrive since the hatchback model isn’t being sold Stateside. Thankfully, we shouldn’t have to wait too long for the A35 sedan to arrive, because Mercedes-AMG has released a new teaser video on Facebook teasing the new compact performance sedan, suggesting an official reveal could be imminent. Being a variant of the existing five-door, we already know what to expect from the A35 sedan. Power will be sourced from a turbocharged 2.0-liter four-cylinder that sends 302 horsepower and 295 lb-ft of torque to an all-wheel-drive system The turbocharged unit will be paired with a seven-speed dual-clutch automatic gearbox. In the hatchback, this setup enables the A35 to hit 62 mph in 4.7 seconds and reach a top speed of 155 mph. Specifications for the A35 sedan should be very similar, although it could have a slightly slower 0-62 mph sprint time thanks to the car’s extra weight. 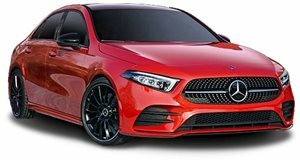 Compared to the regular A-Class sedan, the A35 will feature some aggressive styling tweaks such as a unique grille, aero flics, a large rear spoiler, and dual exhaust tips. At the back, the teaser video shows the sedan version will sport a slightly different diffuser design than the hatchback. Like other A-Class models, the interior will feature the automaker’s dual-screen MBUX infotainment system. Driving modes in the A35 include Comfort, Sport, Sport+, Individual, and Slippery. The release of the teaser video suggests the Mercedes-AMG A35 sedan could break cover online this week, but it isn’t clear yet when sales will begin in the US. Hopefully, it will arrive in dealers before the end of the year.